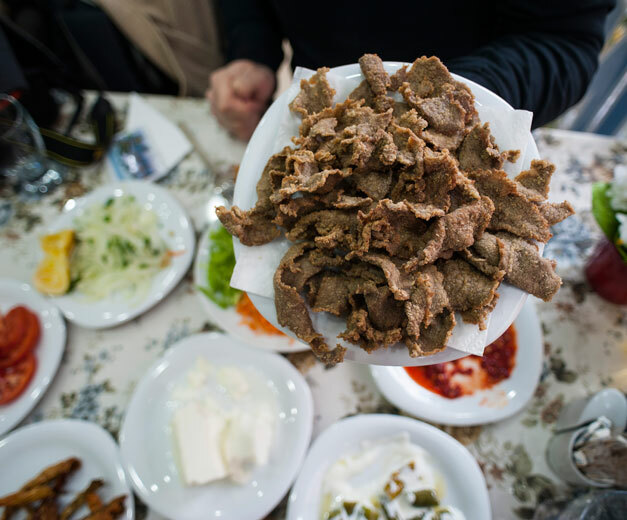 Edirne has more meat to offer beyond the glistening liver that bears its name. Deniz Börek Salonu has crowned the top of Saraçlar Caddesi since 1986. 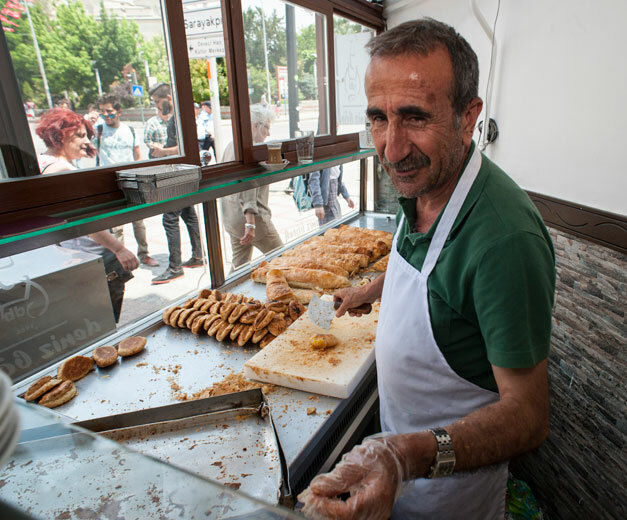 Every morning, lines of salivating citizens hurry to work with crunchy poğaças or sit down to enjoy steaming heaps of stuffed pastry. While there are many börek places in Edirne, few are able to produce the consistently delicious product that Deniz is known for. Imagine, if you will, savory labyrinthine baklava sheets of golden-brown pastry, stuffed like sausages. The bready tubes are baked, set on a hot table in a window, then viciously chopped into strips with a knife that looks like it should belong to a 19th-century werewolf hunter. Common fare at börek places are kıymalı (minced meat), peynirli (salty white cheese), patatesli (potatoes) and ıspanaklı (spinach). The insanity of the lunch hour at Deniz is like a controlled tornado. The thunk of the börek knife, steady splatter of the ayran frother and calls of waiters with orders create a song danced to by the patrons hunting tables and the staff hauling börek. One waiter showed us a scar running the length of his arm that he received when carrying a hot tray of börek from the ovens. 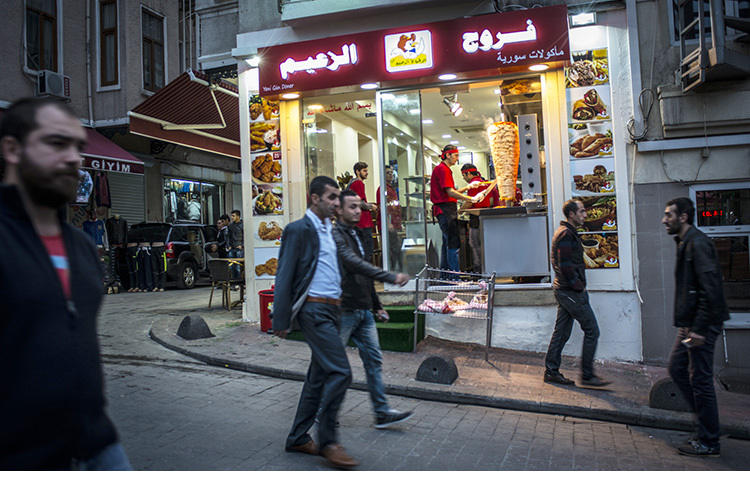 Runners with carts full of freshly prepared börek tubes cross the busy thoroughfares of downtown Edirne to refill missing provisions. 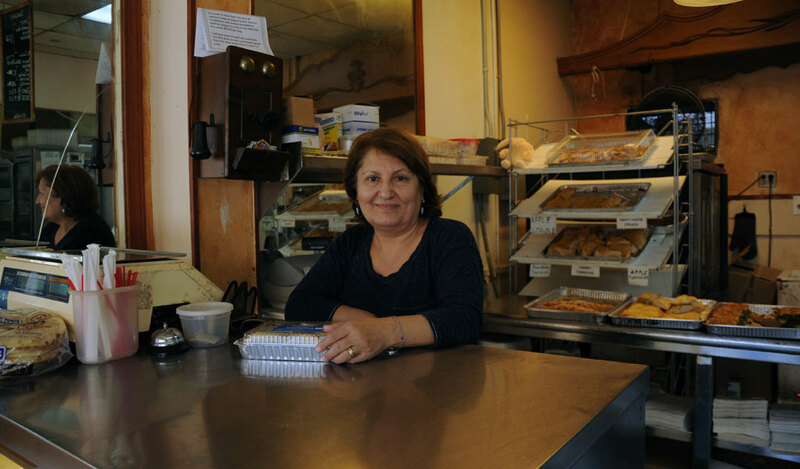 While the ovens are situated at Deniz Börek, the dough is roughed up several blocks away. 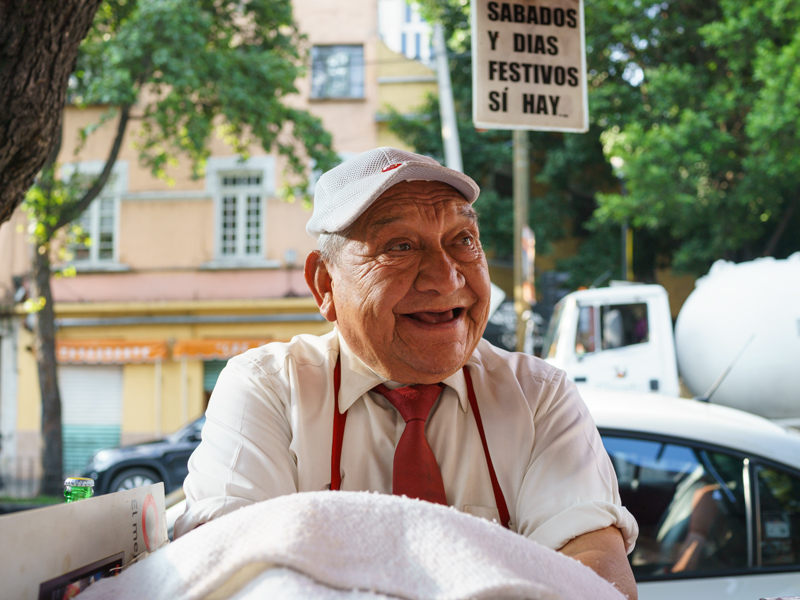 Dough shaped like humped flying saucers is flattened to the thickness of tissue paper, tossed in the air like a massive pizza membrane and then buttered. Huge vats of the golden fat are literally on hand to slather the delicate dough as it is folded over and over again. After it is brought down to size, the filling is spread on top and the dough is rolled into a tube and gently placed on a baking tray. Deniz prides itself on having quality oil, flour and fillings, but perhaps its greatest strength is its kıyma. Kıyma is minced meat that ranges from spicy and pungent to sweet and supple, depending on who makes it. It is not uncommon to bite through the crispy phyllo pastry that composes the outer shell of the börek to find little kıyma inside. While deceptive, this is understandable due to the price of meat in Turkey. 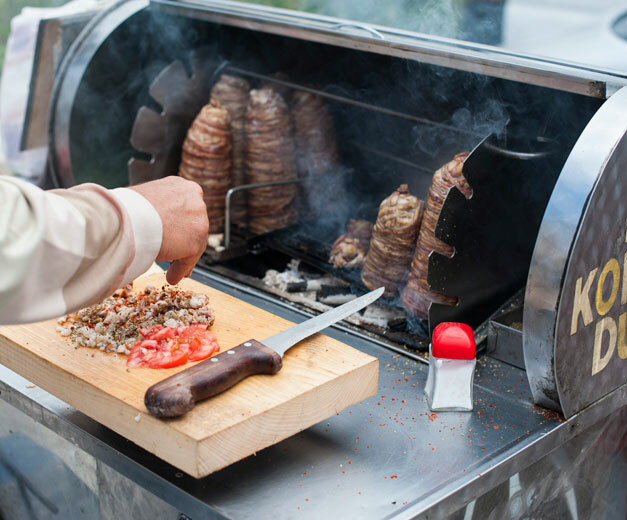 The fluffy air pockets that should hold meat act in the same way as the French fries that always seem to end up inside döner kebap; they are filler. 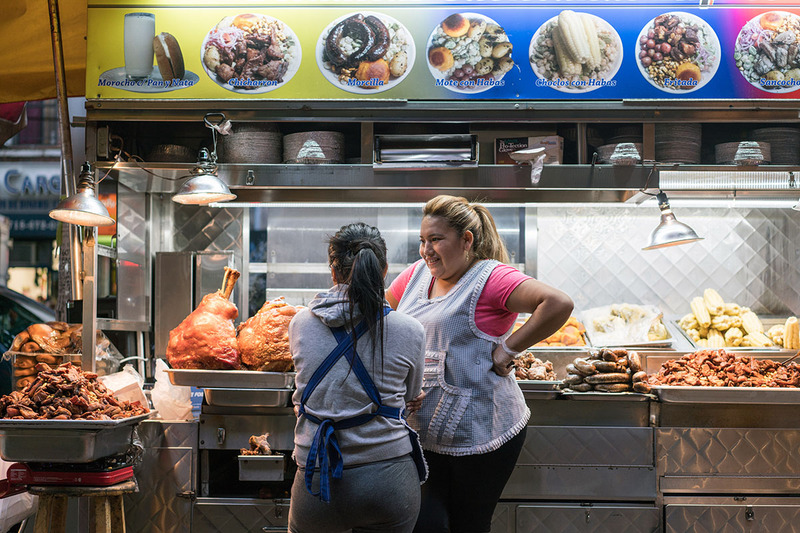 What makes Deniz different is that nearly every bite of börek is bursting with sweet, delicious meat. The secret: onions. They simply keep adding miniscule shavings of onion until the taste is right. Upon baking, the onions seemingly dissolve into the meat and caramelize, bringing out a sumptuous sweet and salty flavor that must have addictive properties. That being said, it is important to arrive at Deniz before 4 p.m., when things slow down. Kıymalı börek tends to go fast, but if you are lucky you will only have to wait 10 minutes for a new batch to be delivered and baked.